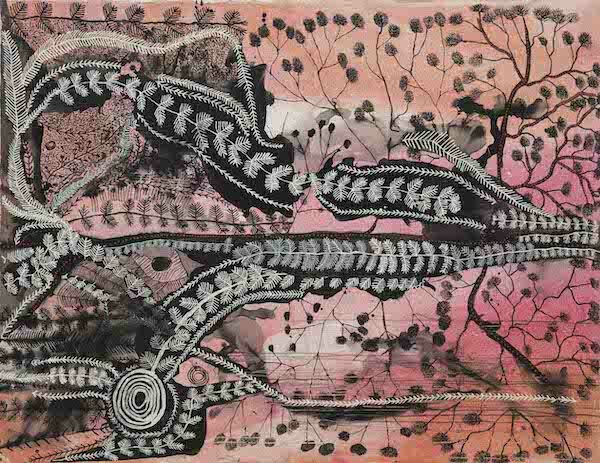 PETER MUNGKURI, ‘Ngura (Country)’, 2018. Ink and synthetic polymer paint on linen, 152 x 198cm. Courtesy: The artist, Iwantja Arts, SA and Alcaston Gallery, Melbourne. Alcaston Gallery presents an exhibition of new paintings by Iwantja Arts senior artists Alec Baker and Peter Mungkuri (Tjilpi) and Betty Muffler and Nellie Coulthard (Pampa). Every mark is imbued with their personal lived experience and their deep connection to country and culture. Each artist’s distinct visual language reflects an unmistakably powerful presence of spirit and collectively their work speaks volumes about the interconnectedness of art, integrity, people and place. These senior artists paint from their memories and their hearts, a connectedness to country.